A boat passes in front of the Osaka Prefectural Office on Enokojima Island (江之子島), between the Kizugawa River (木津川) and the Hyakkenbori Canal (百間堀). 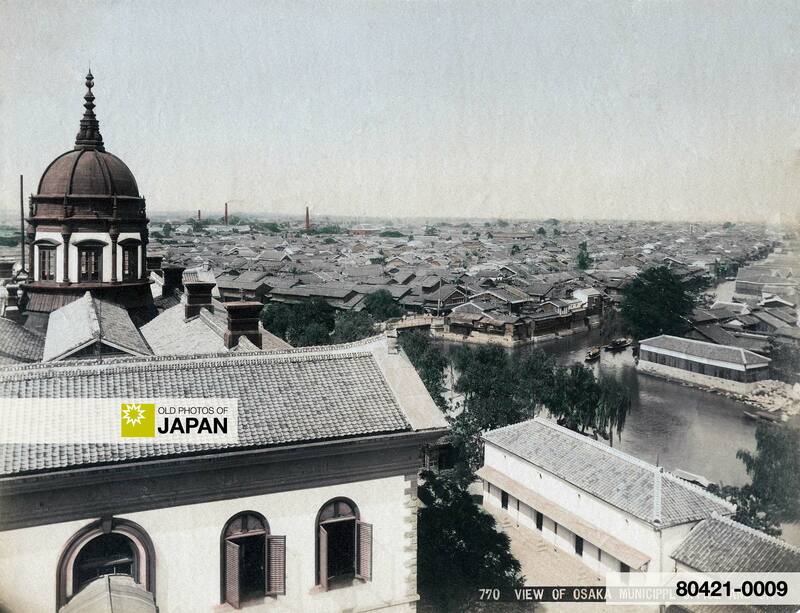 Started in 1872 (Meiji 5) and completed in July 1874 (Meiji 7), the Neo-Renaissance style building featured an impressive dome on top. These days, Osaka’s prefectural government buildings are located in Otemae (大手前), facing Osaka Castle. But during the Meiji (1868-1912) and Taisho (1912-1926) periods, it was the small island of Enokojima which performed the role as Osaka’s governmental area. Designed by Irish civil engineer and architect Thomas James Waters (トーマス・ジェームズ・ウォートルス, 1842–1898), the brick building in Neo-Renaissance style was Osaka’s first genuine Western-style building. It must have been extremely impressive to the eyes of the contemporary inhabitants of Osaka. Stone steps lead to the entrance which bore four columns supporting a pediment with the Imperial chrysanthemum crest. On top of the building stood a monumental dome which offered a beautiful panorama of Osaka, which at the time still consisted mostly of low-rise wooden buildings. 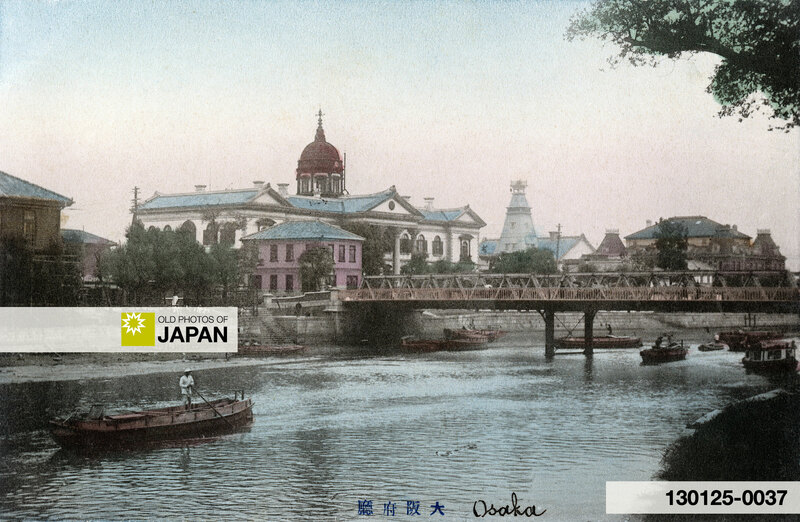 The dome of the Osaka Prefectural Office with a panoramic view of Osaka, 1870s~1880s. 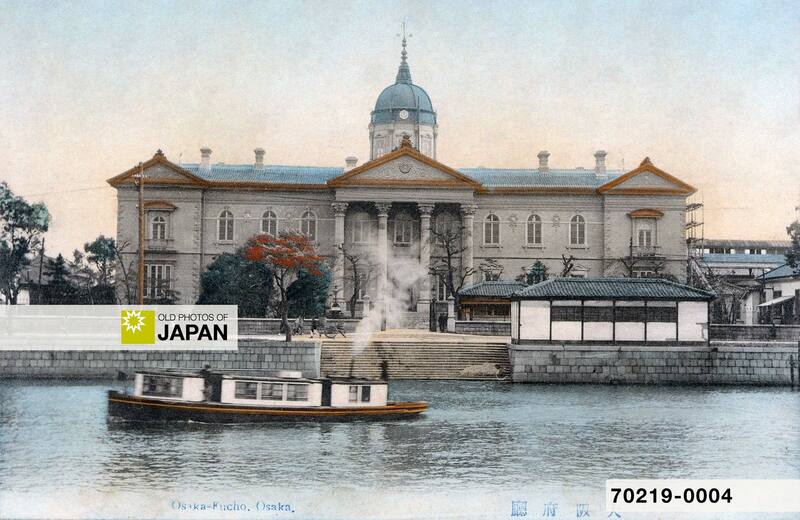 Osaka Prefectural Office as seen from the Kawaguchi Foreign Settlement, 1900s. Osaka’s government offices had been located in Uchi Hommachi in Higashi-ku. But with expansive plans for the development of Osaka’s harbor, the governor saw the future of Osaka in Enokojima, which was located near the harbor. The area was also right next to the Foreign Settlement in Kawaguchi and the red light district in Matsushima (松島). The rivers and canals were still full with boats transporting all the products that supplied the city. It was a lively and exciting place. 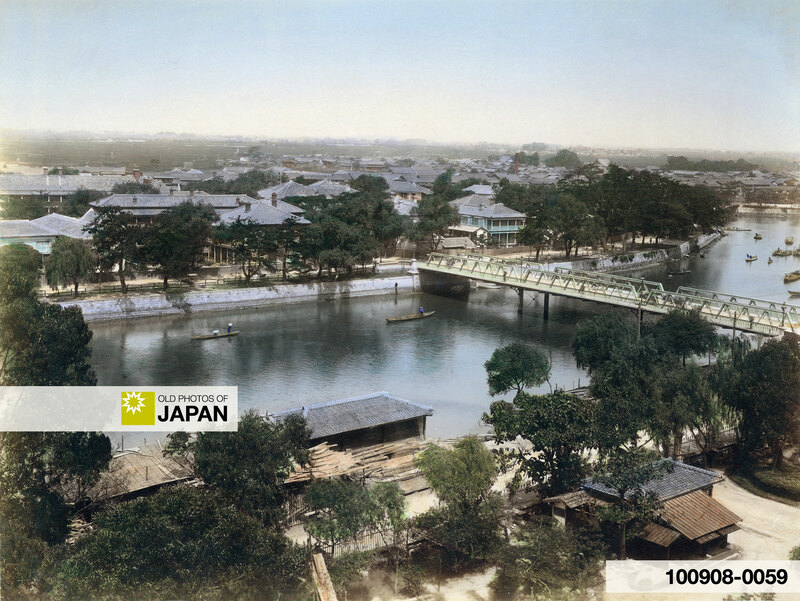 The Kizugawa River and the Kawaguchi Foreign Settlement as seen from Osaka Prefectural Office, 1890s. The building was popularly called Nishi no Seifu (government of the west), which clearly suggests its importance. It would keep that importance until November 1926 (Taisho 15) when the prefectural government was moved to Otemae. The Enokojima building now became the Prefectural Industrial Promotion Office (大阪府工業奨励館), the current Prefectural Industrial Research Institute (大阪府立工業技術研究所), and kept this function until it was destroyed by bombs during the Second World War. 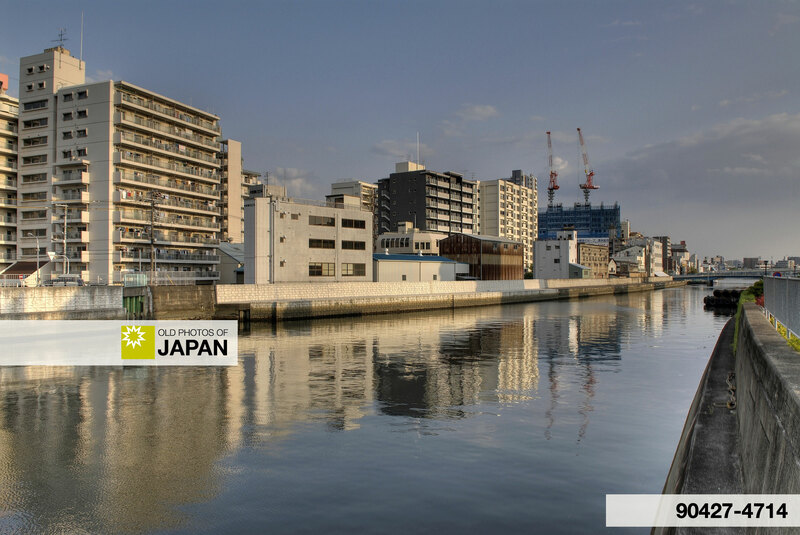 The Hyakkenbori Canal was filled in a long time ago, while the Kizugawa River’s beautiful stoned walls were replaced with ugly concrete banks. Tall apartment buildings now stand where once the Prefectural Office stood. The romance of the area has completely vanished. The Kizugawa River in 2009, as seen from around Matsushima Park, South of Enokojima. 1 Yomiuri Shimbun Shakaibu (1987). Scenes of Naniwa: Osaka Time Tunnel. Warajiya Publishing Co., Ltd, 129. 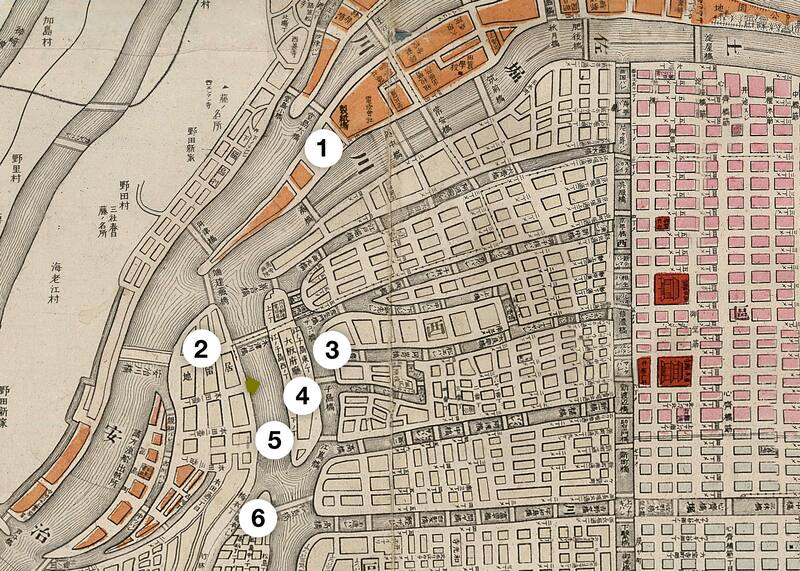 1893 (Meiji 26) Map of Osaka: 1. Nakanoshima (中之島); 2. Kawaguchi Foreign Settlement (川口居留地); 3. Hyakkenbori River (百間堀); 4. Prefectural Office on Enokojima (江之子島); 5. Kizugawa River (木津川); 6. Matsushima Red Light District (松島遊郭). You can also licence this image online: 70219-0004 @ MeijiShowa.com.